Like many horse breeds, the American Paint Horse is susceptible to a number of genetic problems. The most common is called “lethal white syndrome,” or LWS. 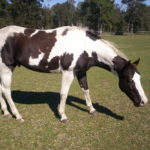 Also known as Overo Lethal White Syndrome (OLWS), Lethal White Overo (LWO), and Overo Lethal White Foal Syndrome (OLWFS), LWS is an autosomal genetic disorder. It affects foals born late, or after the full 11-month gestation period. Externally, they appear to be normal, though they often have all-white or nearly all-white coats with blue eyes. Unfortunately, internally, these foals have a nonfunctioning colon. Within a few hours of birth, signs of colic may appear, resulting in death several days later. 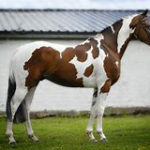 This disorder is linked to the recessive gene associated with the frame overo pattern; horses that are heterozygous carriers of the gene do not develop the condition and are, most often, physically healthy. It is recommended that horses born homozygous for the LWS gene be humanely euthanized shortly after birth. 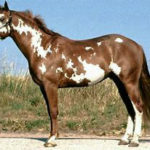 The American Paint Horse is also susceptible to genetic disorders such as Hyperkalemic Periodic Paralysis (HYPP), Hereditary Equine Regional Dermal Asthenia (HERDA), Equine polysaccharide storage myopathy (PSSM), Malignant hyperthermia (MH), and Glycogen Branching Enzyme Deficiency (GBED). Additionally the influence of Thoroughbred breeding puts some bloodlines at higher risk for Wobbler’s syndrome, which affects the cervical vertebrae. Though it is impossible to prevent a Paint Horse from developing a genetic disorder (aside from the humane termination of specific bloodlines), it is necessary to routinely and continuously undergo testing for preventable ailments. Coggins tests can easily detect the presence of Equine Infectious Anemia, and equine health profiles offer fast and affordable diagnostic testing. The health and happiness of your Paint Horse is in your hands. Paint Horses 2019 | All Rights Reserved. Animals theme by Flythemes.